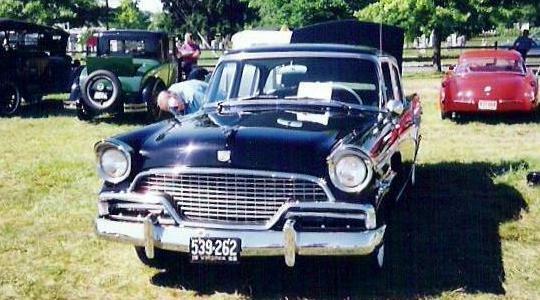 These pictures of a like new 1956 Studebaker President Classic were taken at the Bridgewater, Virginia Steam and Gas Meet a few years ago. The President Classic was four inches longer than the Standard President with the extra space going to the rear seat passengers. President Classics have rear door vent windows which is the easiest way to identify them. All 1956 Presidents were equipped with Studebaker's 289 cubic inch V8 with dual exhausts. The two-tone black and white color scheme on this car is quite elaborate. Starting at the top, the roof is black, the area around the windows is white, the upper body is black, the side flash is white, and the lower body is black. I don't know who owns this car, but I think it is from the Roanoke, Virginia area. The Bridgewater Steam and Gas Meet, which is sponsored by the Bridgewater Volunteer Fire Company, is held every year in July. This picture of a C Cab Flatbed Truck was taken at a Studebaker meet in Gettysburg, Pennsylvania some years ago. 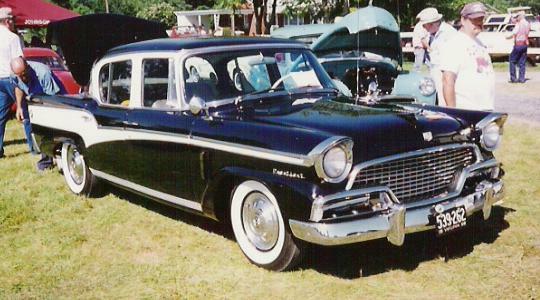 The big fiberglass front grille was introduced in 1957 and continued essentially unchanged until the end of production in December 1963. After the Champ Pickup with its Lark derived cab was introduced in 1960, the C Cab continued to be produced for heavy duty commercial trucks. The picture below was taken at the same meet. It shows two C Cab Tractors including one with a trailer attached. Studebaker did not produce many tractors, although a South Bend firm under contract to Studebaker did for a time use Studebaker tractors to haul new Studes to dealerships.